At the beginning of the adventure chronicled in The Mark of the Spider, the protagonist, nature photographer Sebastian Arnett, would definitely say, There is no such thing as ghosts. Or demons. Or a true black orchid. You’ll have to read the book to see whether he changes his mind about the demon thing. He will never change his mind about black orchids, however. ‘Cause there ain’t no such thing as a black orchid. There is a Black Orchid perfume. A Black Orchid comic book character. A double mystery by Rex Stout. A Black Orchid movie starring Sophia Loren and Anthony Quinn and an earlier one from 1953. There are Black Orchid music albums and an Australian goth band. But no black orchid flower. There are two shades, however, that orchids do not naturally blossom in: a true blue or a true black. They simply do not have the genetic makeup to make these pigments. There are some varieties of purple orchids that look very blue, but upon close inspection are really a shade of purple. 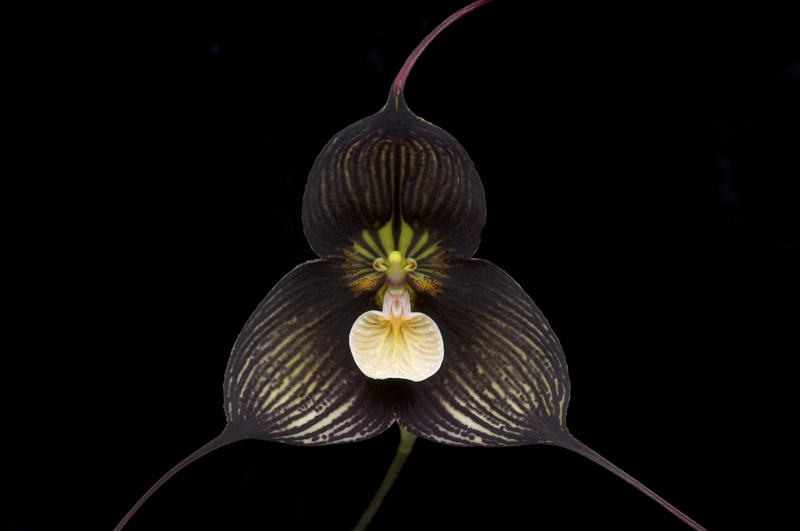 Similarly, black orchids have an extremely rich pigmentation that looks almost black but is not a true black color. So what’s that black orchid pictured on the cover of The Mark of the Spider? It is a deep purple bloom of the Dracula vampira species. And how cool is the name? I sent several photos of dark (but not black) orchids to my book designer (Damon Freeman of Damonza.com), and he liked this one best. I agree. What drew me to the idea of a black orchid? Obviously, it’s not original to me. Black connotes something dark, mysterious, potentially dangerous. And orchids are complex, incredibly beautiful plants. The two words combined — black orchid — convey the dangerous allure that I needed to entice my protagonist into doing something he normally would never do. And since I plan to write more than one Sebastian Arnett adventure, I wanted an intriguing name for the series. Black Orchid was an obvious candidate, and my son suggested that the series be chronicles. And so they are, the Black Orchid Chronicles. Order your copy of The Mark of the Spider: A Black Orchid Chronicle from Amazon today and start enjoying. This entry was posted in Black Orchid series, Fiction, Mostly Me, Writing by David. Bookmark the permalink.